Donegal (Irish: Dún na nGall) is a town in County Donegal, Ireland. Donegal is not the county town (capital) of County Donegal, despite being its namesake. Rather, the county town is Lifford, and Letterkenny is the county's largest town. Donegal town is situated at the mouth of Donegal Bay and is overshadowed by the Bluestack Mountains. The Irish name translates into English as Fort of the Foreigners (Vikings). There is evidence for settlements around the town dating back to prehistoric times including the remains of round forts and other earth works. There is a record of an early Danish fortress being destroyed by Muirchertach MacLochlainn, High King of Ireland in 1159. This Viking settlement is possibly the origin of the town's name. Donegal Town itself is famous for being the former home to the O'Donnell clan, who played a pivotal role in Irish history. From the 15th to the 17th century, they provided the main opposition to the colonization of Ireland by England. 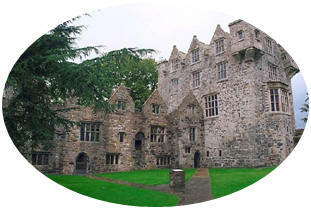 The town itself contains Donegal castle (shown above) and the remains of a Franciscan abbey which dates back to the 15th century. The Annals of the Four Masters are traditionally thought to have been started in the abbey in the early 17th century. The story of Red Hugh O'Donnell, Lord of Tyrconnel, was the inspiration behind many books and films, not least, Disney's The Fighting Prince of Donegal (1966). After the Flight of the Earls in 1607, the castle and its lands were given to an English captain, Basil Brooke, as part of the Plantation of Ulster. Brooke carried out major reconstruction work and added a wing to the castle in the Jacobean style. The current plan of the town was also laid out including an attractive town square or Diamond. From the late seventeenth until the early twentieth centuries, Donegal Town formed part of the vast estates of the Gore family (from 1762 Earls of Arran) and it while in their ownership that the town took on its present appearance. Donegal returned two members to the Irish Parliament until the Act of Union (1800). Evidence of the Irish Famine still exists including a workhouse, whose buildings are now part of the local hospital, and a famine grave. Traditionally the largest employer in the town has been Magee of Donegal. They are internationally known for their fine tweed garments, some of which can be seen being woven by hand on small looms in the company's department store.